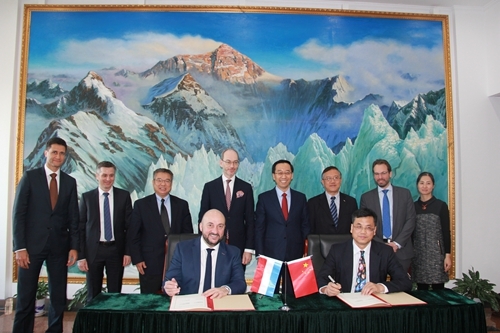 On Jan. 16th, 2018, after intenvise exchanges of opinions, a Memorandum of Understanding (MoU) was signed between Ministry of the Economy of the Grand Duchy of Luxembourg and National Space Science Center of Chinese Academy of Sciences to establish Research Laboratory of Deep Space Exploration (RLDE) in Luxembourg which will implementthe concurrent design of deep and new technology of space exploration missionsfocusing on the exploration and utilization of the resources in the solar system. The MoU defines the establishment, operation, cooperation mechanism and intellectual property rights etc. and will lay a solid foundation for the two sides to continue substantive cooperation in a bid to build an advanced research institute focusing on space resources exploration and utilization. The exploration and utilization of space resources is an important emerging field to study the origin of solar system, explore extraterrestrial life, expand the living space of mankind, reserve new resources, and encourage the commercialization of space exploration. In February 2016, Luxemburg officially launched the "Space Resource Initiative", thus became the first country in the world to set the goal of acquiring space resources as government initiative. National Space Science Center is the leading institute in China responsible for managing all the space science missions in the Strategic Priority Research Program. During the process of organizing and implementing the space science missions, NSSC has accumulated rich experience in space mission study. The Research Laboratory of Deep Space Exploration combines the core advantage resources of CAS in the field of space science and the strategic needs of Luxemburg. The lab will strive to become the center for the study and design of deep sapce exploration missions and space resuouces utilization missions, as well as the key insitute of cutting edge technology research in Europe and even in the world.